I have to apologise–and warn–you all, yet again. Because this is another Nigella inspired recipe. But, but, but–look at it! It’s beautiful! And wait till you taste it–you won’t believe something so creamy can be healthy. The original recipe (from Nigella’s new Nigellissima) contains quite a bit of cheese and cream, so a big no no for all of us vegans out there. My take on this Italian recipe is made with butter beans, tofu and almond milk, which considerably lowers the amount of fatty ingredients and makes this a lighter (not to mention kinder) dish. No offence to Ms Lawson. I can’t honestly say I’m a fan of fake cheeses–every once in a while, it’s nice to melt some on your pizza, but otherwise I stay away from them. It’s never like the real deal, so why bother? But when you want melty, gooey comfort foods, you’ve got to make a bit of an effort. So although I call this ‘ricotta’, it’s nothing like ricotta; but it does have a similar creamy, melt-in-your-mouth, light texture. Pre-heat the oven to 200ºC. Steam the spinach until it wilts. Blend the butter beans, tofu, soya cream, almond milk, mustard, olive oil and garlic in a food processor until more or less smooth. Add salt and pepper according to taste, as well as the ground nutmeg (feel free to add more than listed in the ingredients list if you please). 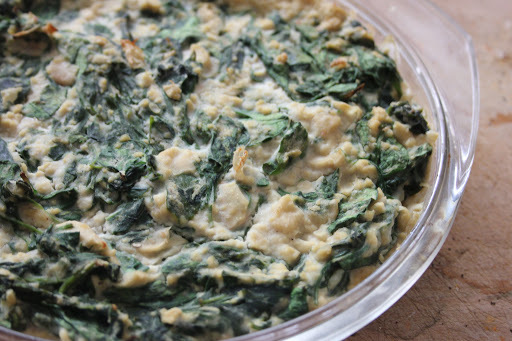 Mix in the spinach, coating them with the ‘ricotta’ mixture. 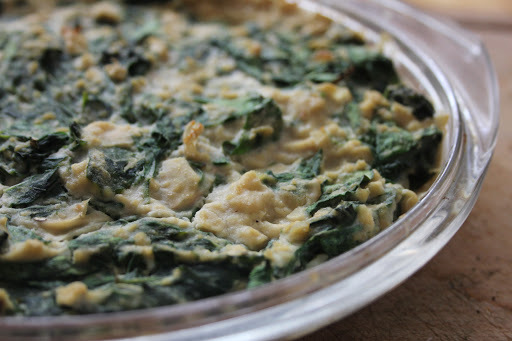 Grease an ovenproof dish and pour in the creamy spinach. Bake in the oven for 15 minutes. Let it rest for at least 5 minutes before serving. 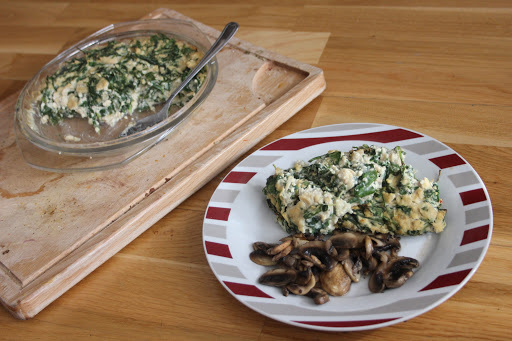 I served my spinach with some fried mushrooms, but I think this would be lovely with some pasta, or served on warm ciabatta bread. Whatever tickles your fancy! 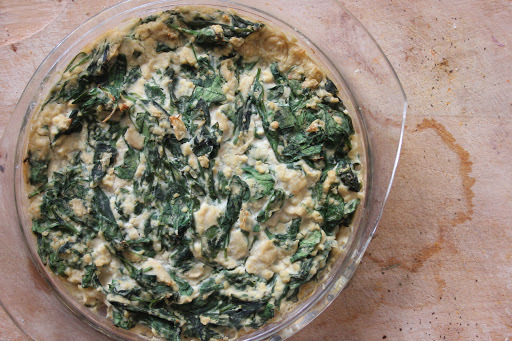 What does the 'ricotta' mixture consist of? Could you tell me this recipe in cups rather than g’s? Hi Kristy, sorry but I can’t tell you what the measurements are in cups, I didn’t do the conversion at the time I created this recipe and it’s been years since I posted it, so I don’t have my original notes to base myself on. A quick Google search should help you out, though.